Who are Medical Relief International? Medical Relief International is a UK based charity that is supported by doctors and other medical staff in providing life-changing care worldwide. The help they offer varies from emergency food, first aid, and educational support to some of the globe’s most vulnerable individuals. Instances, when help becomes most needed, are during natural disasters, wide-spread cases of famine and outbreaks of war. The people that MRI gives help to include young families, orphaned children and refugees. MRI’s aid is offered on zero prejudice grounds – regardless of the individual’s faith, race and family background. We can assure that we meet our pledges to full and all of our fundraised activities are eligible and to put together in order to help those who need it most. The Birmingham-based CEO of MRI recently travelled to Pakistan in order to help and discuss future projects in and around the Gujar Khan and Khallar Syedan area. The visit had kindly been arranged by Muhammad Ejaz Sharieff of the Mandra Eye Hospitals Head-office team based in Karachi. 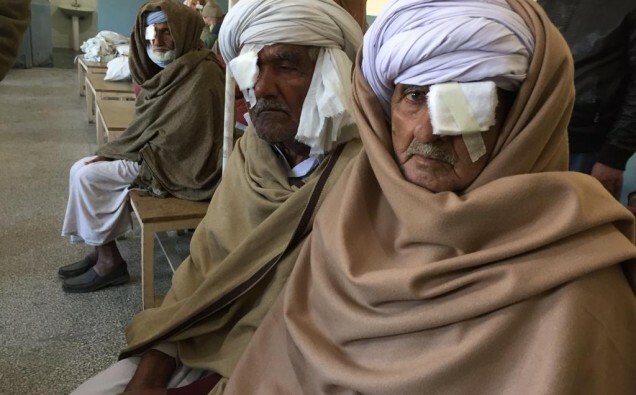 The project’s aim is to help the disabled and impoverished families who suffer from visual impairment, by covering the cost of surgery for the poorest in Pakistani society at the hospital in Mandra. The amazing MRI associated clinics of our partners in Pothwar province serves the entire region and beyond. Without the help of overseas donations, many of those that travel to the clinic wouldn’t get the treatment they deserve, to save a sight is to save a life. Currently, Pakistan has almost 20 million people that are either blind or suffering from visual impairment; of those 2.6 million are children. Medical Relief International upon arrival pledged to cover the future cost of some of the surgery for the patients at the clinic, with further surgeries pledged within the next few weeks leading up to Ramadan, at present an average of over 8000 surgeries are performed here at the Mandra eye clinic. This coming Ramadan will bring the season of zakat, and charitable giving. Medical Relief International kindly request local businesses in the UK to choose us as your charity of choice. We pledge to continue to help the world’s most impoverished families in Pakistan, including the disabled, and many other deserving people who will become beneficiaries from this article.